Could anyone help to identify the manufacturer of some type, please? The ‘logo’ appears on the As and is the letters ‘DC’ in a circle within another circle. This is good quality, well made wood type. Age as yet unknown but pre ww2. Further to my previous question, a further example clearly shows, to the naked eye, PATENTED HARD FACE MACHINE CUT between the two circles. The initials in the centre are D & C.
Your wood type was manufactured by Ventris of London, England, a long extinct wood type manufacturer. I don’t have the slightest clue what the D&C in the center of the inner circle stands for, but this was their mark. I actually ran across this last night in a little book titled “Wood Type & Printing Collectibles” by Robert Long, copyright 1980. I have a few hundred fonts of wood type, but none from Ventris. Of interest to you might be the fact that I do have a wooden font named Arcadian! Sorry to be so late replying!!!! well….. it is only 10 months! Really interesting. Thank you. I eventually discovered the D & C as well, Day and Collins! Also I have not heard of the Arcadian font. Can you post a pic plese??? Just an odd letter or two so I get the idea. Any ideas from that magic book of yours who L & M were in the printing world, possibly 1940s, maybe 50s? 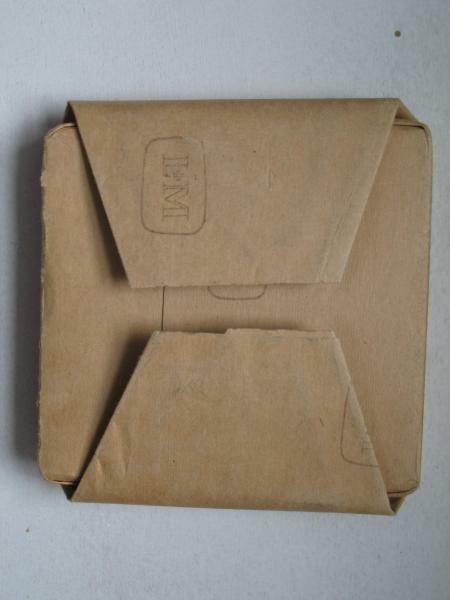 Any one have any ideas who L & M were in the printing world,please, possibly 1940s, maybe 50s? In the early 70’s we had an old flatbed cylinder used it once per year could diecut 28x40 for sure. Don’t know it was a converted letterpresss or not. The shop had a low ceiling so the autofeeder was removed. had to push sheets into gripper by hand auto delivery to skid on chains. Similar to big Miehles. Isn’t L&M the UK business “Linotype & Machinery Ltd” which sold all kinds of printing equipment including Miehles? There may be other companies with the same initials. Sorry to not have the computer savvy to scan and send a photo of the Arcadian wood type face. I can tell you that it has a distinct antique flavor to it and can best be described as a Clarendon with added small “bumps” (half rounds) added on the top, bottom and mid-way in between. It can be seen on page 131 of Rob Roy Kelly’s classic “American Wood Type: 1828-1900” a ‘must-have’ reference book for those interested in wood type and it is also displayed in Greg Ruffa’s new book “The Art of Wood Type”, also a great reference book on the subject. L & M is a bit vague to go on. Are you asking about in the U.S. or continental Europe? 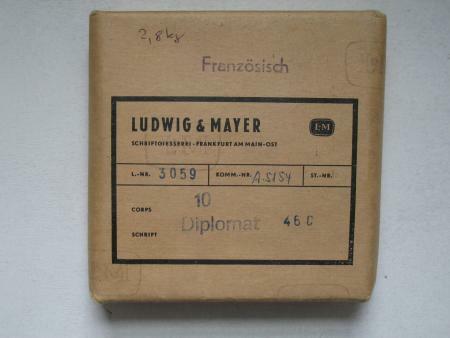 Ludwig & Mayer (sp?) was a German Type Foundry if memory serves me right. Day and Collins wood type (Ventris’ Patent) were in London and then moved out to Leicester in the 20s. I have a catalogue of theirs for London and for Leicester. I’m glad that this thread has stayed alive. OK, now I am curious. What exactly was Ventris’ Patent? Was it for the typeface design or a method of cutting and producing wood type? Thank you for the Day & Collins info. That really helps. I could not figure out where Ventris and Day & Collins ‘met’. I shall look in the books above ( if I can find copies available!!) and read more about it. As for the L & M as yet I have no more info…… the ‘assistant d.arcadian’ (!!!) found a book of type styles whilst on a visit to Yorkshire with the title L&M News………. Two contenders are Ludwig & Mayer, but the book is in English and Love & Malcolmson, but they were inhouse….so as yet the Linotype & Machinery seems the best bet. Albion Press, is there any way that you would want to sell me that D&C book??? Please!!! So, now to find those books and look up the font that was named after ME!!! Ah! Not ( yet) being very rich I think I have a small problem with buying those books! So……I shall have to start saving! Well, a book of type styles would by its content indicate handset or machine composition: if you see faces like Georgian or Estienne (and these only in text sizes, no display), they are exclusive to Linotype & Machinery. There may also be references to “matrix information”. Foundry faces from the Continent would suggest Ludwig & Mayer; a mix of foundry and machine-set faces would suggest a typesetting company, rather than a manufacturer of type or mats. Ludwig & Mayer were typefounders in Frankfurt am Main, they did also manufacture wooden type. I have several packs of new type from them. I attach a photo, that will enable to see their logo and you could compare it with what you have got. I’ll try again with the photo. Didn’t manage to get it attached. I look forward to seeing them. Is it my fault? There are just empty spaces where the pictures should be! I just noticed your broken images, Thomas. The site has a glitch that prevents it from displaying images with ampersands in their names. I changed L&M to L-M and re-uploaded. Sorry can’t sell you the D & C. But I will see if I have anything “spare” or even photocopies. Some more info has cropped up. I have a copy of the Printers’ and Stationers’ Year Book and Diary for 1905 and the attached advert was enclosed. Also there is a few lines of copy “Wood Letter and Printers’ Joinery. 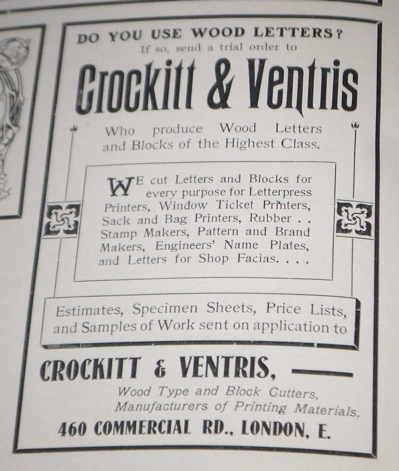 Of the firm of Crockitt and Ventris, 460 Commercial road, London, E., Mr Ventris is the original inventor of the well-known machine for cutting wood-letter on the end grain, and the firm employ these machines in their own works, where their staff are always busily engaged on this and other wood work and joinery for printers and binders. The trade should get this firm’s price list and note the moderate charges”. So that may well explain Ventris’ Patent, either Day and Collins bought the patent, the company of Crockitt and Ventris or Ventris jumped ship and took his ideas with him. I only found this information by pure chance, glancing through the book having thought I hadn’t looked at it for some time. 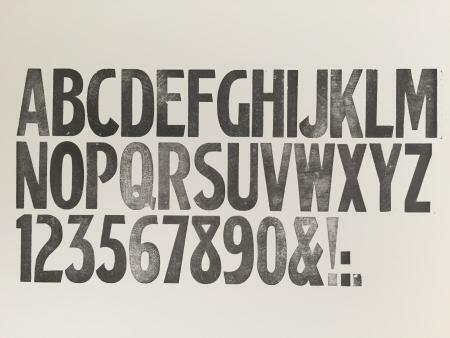 Incidentally I have never seen any wood type made by Crockitt and Ventris, but plenty by Day and Collins. The site will not display images with unusual characters in their names. See the help pages at http://www.briarpress.org/14948 . And Oops will bear that in mind. I am fascinated by the info regarding Ventris. It does make a sense out of a nonsense. Thanks for all your help. Proofing some beautiful though incomplete wood type today. This type has exactly the makers mark discussed in this post. An old post I know but I thought someone may in a position to identify it?